There are over 50 blue plaques covering the Hayle area. Their locations are shown on the Discover Hayle Map available from the Town Council office, the Hayle Heritage Centre and the Library. In due course, additional information will be added and may be accessed by clicking on the plaque below. 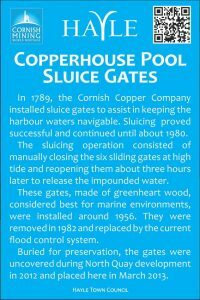 A booklet giving more details of the blue plaques, including a walk connecting them, is available from the Hayle Heritage Centre in Foundry Square.